Advancement, Student Success, Marketing, Recruitment and Admissions--You need a 360-degree view of your students and alumni. We’ve all heard about becoming a connected institution before, but what does that really mean? Learn how to overcome the challenges of multiple systems and student databases with a powerful connected campus solution. - How the Salesforce platform is built to eliminate both data silos and departmental process silos. - How do you know if your systems can integrate with Salesforce? - How to overcomes challenges like connecting to a Student Information System (SIS) where Salesforce will not be the system of record. - Ideas for enabling your school to better serve the needs of your students, staff, alumni and donors. In spite of the vast number of technologies involved, an Industry 4.0 transformation is about a single, fundamental strategy: connecting manufacturing business processes via application integration. Join us as we delve into the results of a recent survey conducted by Informa/IndustryWeek that explores the barriers to enabling connected manufacturing and digital supply chain, and how enterprises can connect their manufacturing business processes to maximize the impact of new Industry 4.0 technologies. We will share real-world examples and a live demo to show you how companies can leverage integration as an enabler to connect their existing systems such as ERP to Industry 4.0 technologies to turbo-charge their business. The manufacturing industry is undergoing rapid transformation due to the continuously evolving market landscape. Factors including market demands, manufacturing costs, and global supply-demand are forcing companies to resort to lean and agile manufacturing processes. On top of that, the rapid proliferation of modern SaaS based applications is creating data silos which makes companies less agile as they are unable to react quickly, let alone innovate. Thankfully, there’s a solution. With Jitterbit’s industry leading Enterprise iPaaS platform, you can easily unlock data in your existing systems and make informed decisions to accelerate your business and improve customer experience. See our live demo showcasing how you can unlock the power of data through our API integration platform to enable secure and connected manufacturing processes across your value chain. Save your seat today! API’s are redefining every platform and every platform and company must have an API strategy. JB can help you build an API Integration Strategy to any platform: Salesforce, SAP, Netsuite, ServiceNow or Workday. Our SI’s are adding value to their solutions by connecting platforms in exciting ways. Learn how to build your API and integration competency within your practice teams with a free consultation! You maybe asking why partner with Jitterbit? Jitterbit was ranked as a Leader in the Gartner Magic Quadrant for Integration Platform as a Service (iPaaS) the last three years in a row and #1 in customer satisfaction on G2Crowd. And The EiPaaS market is growing 70% YoY! So it’s a good time to partner with the market leader! Companies in industries such as retail, manufacturing, insurance and healthcare need to account for ever-expanding global supply chains where the exchange and processing of information are paramount. In order to remain competitive, companies need to move away from manual processes, and automate critical processes such as orders, invoices, and shipments. How have companies reduced costs by 90% and done this quickly? How can organizations fulfill orders faster, reduce downtime due to system errors, and optimize supply chains? How can you get your trading partners setup quickly and cost efficiently? Blockchain is predicted to be even more disruptive than the advent of the internet! Since the first quarter of 2018 there has been a 400% rise in funding for Blockchain companies, with over 138 new Blockchain companies launched as this radical shift begins. - Get their perspective on how blockchain will influence future IT infrastructures and how you’ll need to re-architect your concepts of trust and digital rights. See our visionary demo on how Blockchain and IoT integration can power the most secure end-to-end transportation of goods across your value chain. Save your seat today! Workday Rising 2018 was a show packed with great discussions around Workday Prism Analytics and how enterprises are amplifying the value of Workday by connecting Human Capital Management and Financial applications with other systems. Questions included: How do enterprises manage their employee on-boarding and off-boarding today? How do enterprises eliminate all the manual effort in extracting employee information from so many disparate systems? How are companies building their Connected Enterprise 4X faster? A robust API lifecycle is critical, but were you shocked by how long it can take to get through all essential stages? So were we. That’s why we’re going to show you 5 proven hacks -- including live demos -- that will safely and securely get your APIs into production faster; much faster. Topics include: auto-creating APIs for connectivity to existing applications or data sources, accelerating development with an API Proxy, the simple but powerful 3-30-3 rule for enhancing APIs, unlocking the power of OData APIs, and how the pro’s safely perform rapid trial and error. Come and see 5 hacks in 50 minutes and get days or even weeks of your life back! To compete in the world of Industry 4.0, manufacturers must make strategic use of analytics, artificial intelligence, and automation --- all of which rely on data. Your company's data is a virtual gold mine. But you have to be able to see below the surface to tap its potential. Join us for this webinar, where we'll share how Jitterbit and Mountain Point worked with luxury textile manufacturer Matouk to create an integrated data system yielding an ROI of 233% in just six months! We'll discuss ways to unlock and understand your data. Then we'll tackle strategies for using that insight to improve operational efficiency, track your outcomes, serve your customers and even predict the future! About Jitterbit: Jitterbit’s industry-leading API integration platform helps manufacturers bridge legacy or third-party data systems to drive efficiency and gain insight throughout your company. About Mountain Point: Mountain Point guides companies through digital transformation initiatives and has deep expertise in Cloud ERP and systems integration. As the only Salesforce partner focusing exclusively on the manufacturing sector, Mountain Point is the leading expert in harnessing the power of the Salesforce Manufacturing Cloud. "I didn't know Jitterbit could do that!" If you're like most Data Loader users we talk to, you want to do more with Jitterbit. You want additional functionality, including error handling alerts, automated workflows, and better control over Salesforce data. And if you're like many Data Loader users we talk to, you may be surprised to hear these are all standard and much-loved features of the Harmony platform. Join us for a 30-minute webinar and hear about Data Loader users' top 5 favorite features—and why their upgrade has them now saying "Jitterbit can do that!" Dreamforce 2018 was packed with highlights from how to build the connected customer experience to how you can incorporate Blockchain, Einstein Voice and AI. A robust API lifecycle is critical, but were you shocked by how long it can take to get through all essential stages? So were we. That’s why we’re going to show you 5 proven hacks -- including live demos -- that will safely and securely get your APIs into production faster; much faster. Topics include: auto-creating APIs for connectivity to existing applications or data sources, accelerating development with an API Proxy, the simple but powerful 3-30-3 rule for enhancing APIs, unlocking the power of OData APIs, and how the pro’s safely perform rapid trial and error. Come and see 5 hacks in 50 minutes and get days or even weeks of your life back! Employee and customer experiences are key to business success. The integration and API tools used play a fundamental role in driving these experiences. The Jitterbit Harmony “Summer ‘18” release is here! Our latest release delivers the exciting new features and important updates you’d expect from Jitterbit as the Enterprise iPaaS leader. During this live session our product team will cover what’s new in the Harmony 9.0 platform and answer all of your product-related questions. Register now for our to join your peers and save your seat now for this exclusive event. ASC 606/IFRS 15 is all about revenue recognition, a process which is historically inconsistent across companies and industries. This new regulatory standard will have a considerable impact on your internal business teams, and could result in material weaknesses for companies and set you up for fines. Recognizing revenue often has many different factors coming into play throughout the lifecycle of the sale – subscription models (monthly fees vs. up-front costs), product and service bundling, termination fees, rebates, warranties, shipping, etc. This is where an Enterprise iPaaS (EiPaaS) solution can benefit you for this new financial challenge. Join Jitterbit and ForgeRock as we discuss the revenue recognition initiative and how a cloud-based EiPaaS solution helps you manage this. Colleges and universities are designed for teaching, not technology. But they still need to accurately manage student, staff, and faculty information, from class schedules to tuition bills to paychecks. Too often, legacy systems can create cumbersome data silos and redundancies, slowing down adoption of the new technologies and tools that students and faculty are excited to use. And for schools using Salesforce, Jitterbit is the only HEDA certified integration vendor for the new data standard. Employee and customer experiences are key to business success. Whether you are in IT, Security, HR, or Customer Service, it’s critical to provide an experience that is specific to the individual’s needs. ServiceNow eases this burden and enhances those experiences. However, IT leaders need to figure out how to quickly scale their business and bring data together by integrating dozens, if not hundreds of systems to ServiceNow, such as Workday, Jira, and Salesforce, to build that ultimate employee and customer experience. JitterbitJitterbit helps businesses make faster, more effective decisions by enabling them to unify and exploit data from all sources. 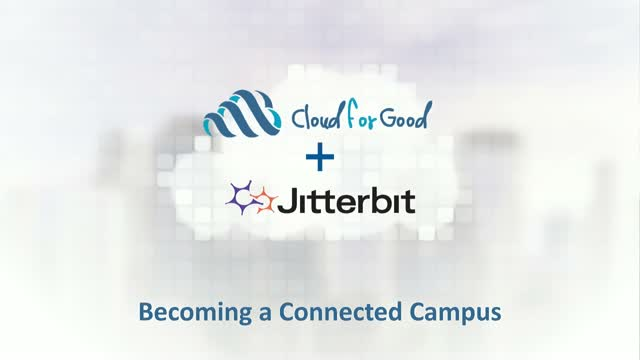 Using the Jitterbit API integration platform companies can rapidly connect SaaS, on-premise and cloud applications and instantly infuse artificial intelligence into any business process. Our intuitive API creation technology enables companies to reuse business-critical applications and data to bring new offerings to market in days, not months. Best of all, our team of industry experts work side by side with you to accelerate innovation beyond anything you previously thought possible. Title: Becoming a Connected Campus is a big vision. So where do you start?